In February, newly elected Democratic congresswoman Ilhan Omar responded to a tweet by journalist Glenn Greenwald that it is “stunning” how much American politicians defend Israel, with “It’s all about the Benjamins, baby.” She got blasted for her tweet, and not just by Trump and Republicans but by leading Democrats, including Nancy Pelosi, who sponsored a “bipartisan” resolution in the Congress demanding Omar apologize for “use of anti-Semitic tropes and prejudicial accusations about Israel’s supporters.” All this set off a wave of vicious attacks on Omar and Muslims in general, including a poster at a West Virginia Republican rally associating Omar (who is an immigrant from Somalia, which had no connection with the attacks of 9/11) with 9/11. Omar has said that “Assassinate Ilhan Omar” is written on gas stations near her house. Basic point number 1: Donald Trump said there were “good people” among the murderous fascist mob chanting “Jews will not replace us” in Charlottesville, Virginia. His regime has legitimized Nazis and created a climate that produced the most lethal anti-Semitic massacre in U.S. history, the mass killing at a Pittsburgh synagogue last October. Any leading figure who can uphold, or tolerate, or “reach across the aisle” to a fascist regime like that has very obviously forfeited any right to speak on who and what is anti-Semitic. So those people should shut up. But point number 2: No amount of Benjamins ($100 bills) buys or sells strategic allies for this bloody-jawed empire. All the conspiracy theories about how the Israel lobby represents—as Omar insisted in a follow-up tweet—“allegiance to a foreign country” channel the outrage people in this country and around the world feel at Israel’s genocidal crimes against the Palestinian people into looking at the world through the lens of what is in the national interest of the United States! And when you look at the world through that lens, you are on your way to complicity with the ongoing crimes of an empire built on genocide, slavery, and wars of empire. Why does the U.S. back Israel? 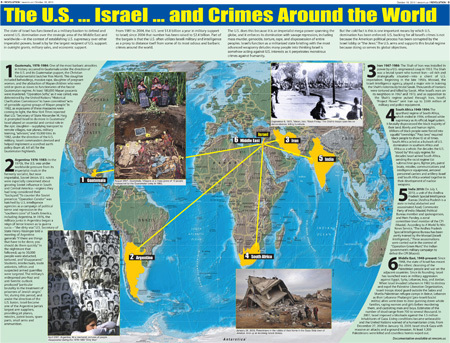 Because for decades, over and over again, from South Africa to Guatemala, and especially in the oil-rich and geographically strategic Middle East, Israel has served as a hit man for the interests of the U.S. empire. Israel’s massive high-tech military, gruesome torturers, assassins, and “advisors” have been unleashed over and over in service of the U.S. to back brutal oppressors and crush popular uprisings. Look up “Israel apartheid nuclear weapons” or “Israel Guatemala Ríos Montt” online. And Israel plays a critical role in U.S. conflicts with rivals like Russia (particularly in the bloodbath in Syria) and in escalating war moves against Iran. 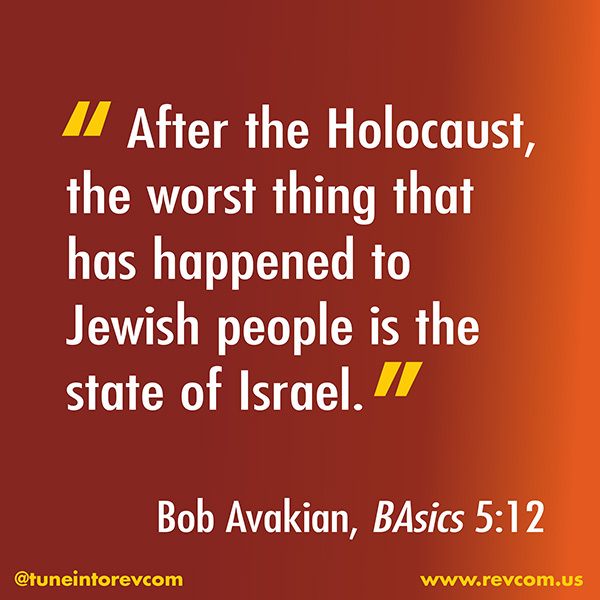 That role—as a nuclear-armed attack dog for the U.S. empire—explains the billions of dollars the U.S. sends to Israel every year and the unflinching U.S. support for Israel’s invasions of its neighbors and ongoing terrorist ethnic cleansing of the Palestinian people. 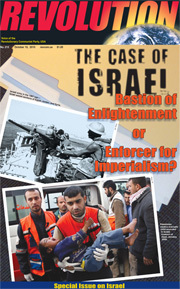 The Israel lobby is not “successful” because it represents the interests of Israel (which it does) or the masses of Jewish people (which it does not); it is “successful” because its agenda coincides with the needs of an empire that sits atop a world of bone- and spirit-crushing exploitation and environmental devastation enforced through torture, terror, and unjust wars. Israel is an essential link in that chain. You want to make the terms of things the national interests of the United States? Defenders of Israel will win that one every time. Let them have it. The national interests of the United States are the problem in this world. Nothing good can come trying to serve them, and nothing good can come from providing cover for the U.S. empire by serving in its Congress.